Brush one side of each slice of bread with a small amount of the olive oil. Arrange on a baking sheet and bake until crisp, about 5 minutes. 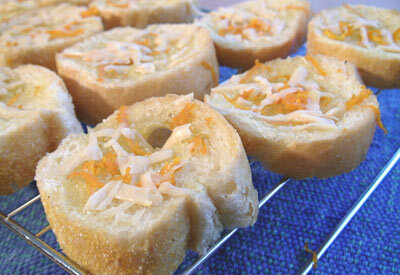 Slice thin slices of cheese using a cheese knife or vegetable peeler, or used grated cheese. Arrange cheese on each piece of toasted bread. Drizzle a small amount of honey over the cheese. Top with orange zest and sprinkle with the pepper.